*This part replaces obsolete part #: and 151281-06. I need a new pad but do not want a hoop and loop. Can l get a pad for p/s discs. Hello Ted, Thank you for the question. Very sorry but checking the model number. 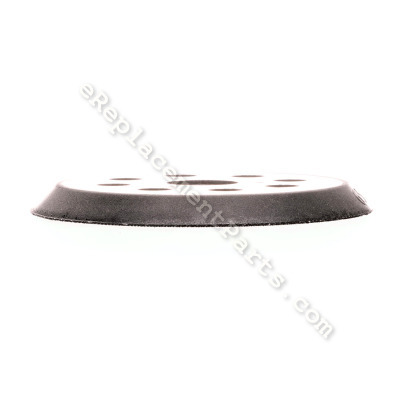 The only pad listed is the Hook and Loop Sander Pad, Part Number: 151281-08. Thank you for your inquiry, good luck with this repair! Removed three screws holding old pad and replaced with new one. Easy repair that saved the price of a new one. The original sander pad had deteriorated. The only special tool you will need is a torx style screwdriver. It is a simple matter of removing the 3 screws that hold the pad to the sander and it should only take a couple minutes to remove and replace the sander pad. Took off the old pad by removing the 3 screws holding it on. Put the new pad on. Then began to use the repaired sander. Instead of spending over $70, total cost was a little over $20. Bad switch and pad wore out. Removed top cap of sander. Noted where the wires where located on the switch. Removed switch cover. Connected the wires to the new switch. Put switch cover on, then installed new switch and put switch cap on. For the pad. I removed the 3 screws from the old pad, and put the new pad on the sander with the 3 screws. Velcro pad worn out and brake and springs severely worn. Unplug sander, remove pad screws, take off pad and remove break. Springs are located on brake. Remove springs and install new ones and if the break pad is worn and speed cannot be controlled, replace break pad and springs. Place new or repaired break assembly on sander, and then Velcro pad and insert the 3 retaining screws. Plug back in and get to work! Sanding pad was coming apart. Removed old pad & installed new one. It was very easy only three screws. Replaced pad. Easy off with the old, on with the new.